CORPUS CHRISTI, TX –Renowned accordionist Chano Cadena is celebrating 66 years in the music business. 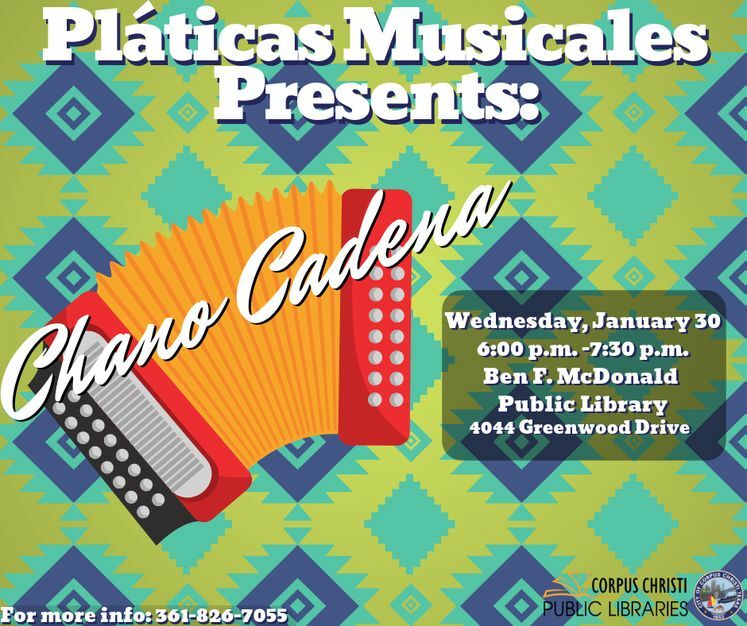 His longtime career and musical talent will take center stage as he performs during this month’s Pláticas Musicales, Wednesday, January 30, from 6:00 p.m. to 7:30 p.m. at the Ben F. McDonald Library, 4044 Greenwood Drive. Well-known across South Texas, Cadena has been honored by both the Conjunto Hall of Fame in San Antonio and the McDonald Library’s La Music del Sur Tejas (The Music of South Texas) exhibit. After a live performance, local music historian, Manuel Ayala, will discuss Cadena’s time in the industry and other insights regarding Conjunto music.